The Hillcrest/Candy Cane Lane neighborhood of Pacific Grove is bordered by Sinex Avenue to the North, David Avenue to the South and is intersected down the middle by Forest Avenue, a main street leading to downtown Pacific Grove’s Lighthouse Avenue shopping and dining district, and the coast. Homes are well maintained and some do offer glimpses of the ocean. Walking or cycling to your destination is easy and a great way to get around from this central home base. It is an excellent neighborhood for families as it is part of the Pacific Grove Unified School District. In fact, Pacific Grove Middle School is located within the neighborhood on Forest Avenue. True to its name, Candy Cane Lane transforms each December into a winter wonderland dating back 55 years in tradition. The 75 homes between Morse Drive and Beaumont Avenue voluntarily participate in lighting their homes with sparkling holiday lights and creative displays and props. There is a small center island where Santa hands out candy to the children with colorful Disney characters, displays, twinkling lights and Christmas music. People flock from all over to take in the beautiful, festive homes and neighbors enjoy spending time with each other in a collective effort to put on a great show for children and their families. People living in the Candy Cane neighborhood truly know their neighbors, giving them a warm sense of community. If you are wondering where residents store these gigantic displays, a storage unit was built in the Pacific Grove corporate yard. It was built in a single day with donated funds. The neighborhood is unique in character and even has old fashioned street lights, relics of Pacific Grove’s original lamps. Halloween is a fun time of year for the neighborhood as well as it is estimated that around 1,500 little ghouls and goblins show up for trick-or-treating. Click here for all available homes for sale in the Hillcrest/Candy Lane neighborhood. 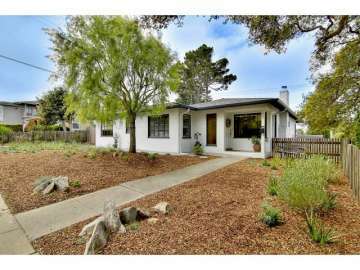 Click here for all available Pacific Grove real estate. 8 homes in this neighborhood sold in 2018. The most expensive home to sell sold for 1.575 million and was a renovated 4 bedroom, 4 bathroom home with 2,105 SqFt of living space on a 6,643 SqFt lot. The least expensive home that sold was a charming PG 2 bedroom, 2 bathroom cottage with 834 SqFt of living space on a large, 10,500 SqFt corner lot and sold for 800K. 12 homes in this neighborhood sold in 2017. The most expensive home to sell, sold for 1.598 million for a 5 bedroom, 3.5 bathroom home with 3,073 SqFt of living space on a 8,400 SqFt lot. The least expensive home sold for 730K for a 3 bedroom, 2 bathroom home with 1,388 SqFt of living space on a 6,100 SqFt lot. 17 homes sold in this neighborhood in 2016. The most expensive home to sell, sold for 1.69 million for a 4 bedroom, 3.5 bathroom, 2,505 SqFt home on a 18,585 SqFt lot; built in 1912 and showcasing its original charm. The least expensive home sold for 682K for a 3 bedroom, 3 bathroom, bank-owned property with 2,060 SqFt of living space on a 6,642 SqFt lot. 8 homes sold in this neighborhood in 2015. The most expensive home sold for 1.2 million for a 5 bedroom, 4 bathroom home with 2,860 SqFt of living space plus a 1 bedroom granny unit on a 9,200 SqFt lot. The least expensive home sold for 395K for a 1 bedroom, 1 bathroom, 2-story fixer with 374 SqFt of living space on a 4,400 SqFt lot. There were 14 homes sold in the neighborhood in 2013. The most expensive home sold in 2013 was a 3 bedroom, 2 bathroom home with 1,861 SqFt of living space on .14 acres, which sold for 1.16 million. The least expensive home was a 3 bedroom, 2 bathroom home with 1,238 SqFt of living space on 8,400 SqFt of land, which sold for 550K. In 2012 there were 12 home sales in the neighborhood, the most expensive home sold for 1.25 million and was a 4 bedroom 2 bathroom home with 2,409 SqFt of living space on a 9,200 SqFt lot on Spazier Avenue. The least expensive home sold in the neighborhood sold for 300K and was a 2 bedroom, 1 bathroom cottage with 1,021 SqFt of living space on a 5,300 SqFt lot on 19th Street. Owning a home in Hillcrest/Candy Lane you will enjoy living in a safe, community-minded neighborhood in beautiful Pacific Grove. The town takes pride in its reputation as “America’s Last Hometown” and those values are evident in its friendly relaxed atmosphere, buildings with historic charm, and rich traditions of festivals and parades. A Victorian home tour is held every October that allows you to experience these unique homes with their intricate details. Per capita the town has more Victorians than any other town. It is also stunningly beautiful, and from Asilomar State Beach to Lovers Point you are just minutes away from amazing sights and endless recreational activities along the shore. Your closest beach will be the stretch of shoreline along the Pacific Grove Marine Gardens Park, which is a sanctuary for marine wildlife. You are a short drive into Monterey where you can explore Cannery Row and the Monterey Bay Aquarium and minutes from Pebble Beach where you can enjoy world class golf and the Inn at Spanish Bay or Pebble Beach Lodge for fine dining or spa treatments. You can also take a short drive south to Carmel-by-the-Sea and stroll Ocean Avenue window shopping and visiting the galleries or enjoying a meal at one of its excellent dining establishments. Carmel Beach is also a wonderful way to spend the afternoon with its perfect white sandy beaches and turquoise water. The Monterey Peninsula has many events during the year which you will be able to take advantage of as a resident of Pacific Grove and many in your own backyard in “PG”. From theatre to concerts to parades and auto shows there is always fun to be had any time of the year. What a wonderful location to call home!